There are no photos with those IDs or post 16898 does not have any attached images! This XXVII edition will be held from the 18 to the 26 in August and has an extensive program of activities. 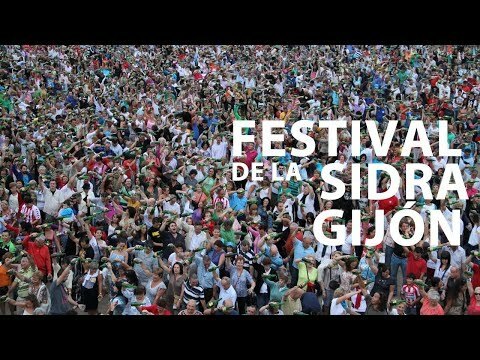 The "Cider Festival" is undoubtedly one of the great festive events of the Gijón summer, declared a Festival of Regional Tourist Interest. Cider and Apple Market / Jardines de la Reina / 17.00 h. to 24.00 h.
Bus of the Cider / Visit to the llagar of Sidra Piñera (Deva) / Stop of El Fomentín / 18.30 h.
Concert of the Cider / Un de Grao / Plaza Mayor / 21.30 h. + info p. 11 Sponsor Sidra JR. Bus of the Cider / Visit to the llaban de Trabanco (Lavandera) / Stop of the Fomentín / 12.00 h.
XXV Official Singing Competition / Plaza Mayor / 17.30 h.
"Art on the Street" Association of Jovellanos Choirs and Dances / Plaza de Italia / 19.00 h.
"Art on the Street" Asturian Folkloric Group The Xustos / Italy Square / 20.00 h.
Bus of the Cider / Visit to the llagar of Sidra Menéndez (Fano) / Stop of the Fomentín / 12.00 h.
(9403 + 1) to surpass last year's record. With the collaboration of Alberto Rodríguez de Escenapache. 20.30 h. approx. 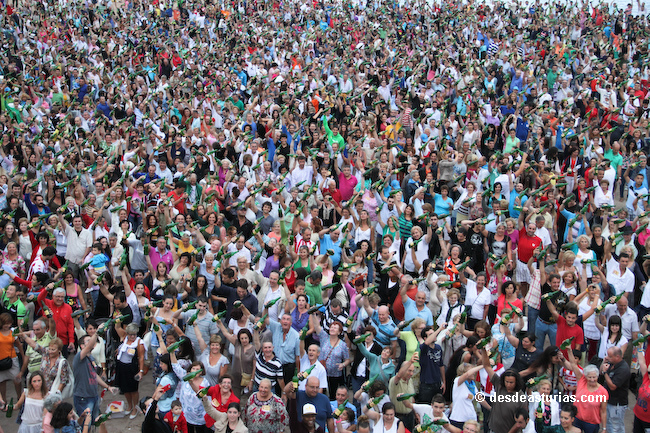 WE WILL BEAT THE WORLD RECORD by pouring together "EL CULÍN"
come with your bottle do not have to queue. Bus of the Cider / Visit to the llagar Castañón (Quintueles) / Stop of the Fomentín / 12.30 h.
Cancios de Chigre / Plaza Mayor / 21.00h. With the performance of the Torner Society and the attending public. Cider and Apple Market / Jardines de la Reina / 11.00 h. to 22.00 h.
Jury Meeting of the Prize "Elogio de Oro" / Plaza Mayor, Plaza del Marqués / 11.30 h.
The Jury will meet to make the tasting and decide which is the best cider served at the Fiesta. Jury Meeting of the Public Prize / Campo Valdés / 11.30h. It can be witnessed by all those people who wish to do so. Ceremonial act, "First Culinary Gift" / Plaza Mayor and Plaza del Marqués / 12.00 h.
Luis Vigón on behalf of Sidra Orizón, winner of the Premiu "Praise of Gold 2017", and D.
Andrés Canal Palacio, on behalf of Sidra Canal, winner of the "Audience Award"
2017 ", will be the first culinos of the Fiesta. Cider tasting at the stands. "Art on the Street" Choirs and Dances Flor de Xaranzaina / Plaza de Italia / 13.00 h.
Delivery "Audience Award" / Plaza Mayor / 14.00 h. (approximate time) and decoration of the booth. finished the cider tasting in the stands. "Art on the Street" Grupo Folclórico La Alegría / Jardines de la Reina / 19.00 h.